The Rev’d Frere Kennedy died in the peace of Christ at the Perley and Rideau Veterans’ Health Centre on Wednesday, April 10, 2019. He was predeceased by his parents, William and Pauline Kennedy, his brother, Gilbert, and sisters Beatrice and Shelagh. Fr. Frere served in the Second World War with the 48th Highlanders of Canada during the Italian and North West Europe campaigns, including the liberation of Holland. 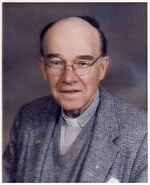 He graduated from the School of Law of the University of Toronto, Bishop’s University in Sherbrooke, and Montreal Diocesan Theological College and was ordained to the Anglican priesthood in 1956, in which capacity he served in a number of parishes in Quebec and Ontario. He was a Priest Associate of the Sisters of St. John the Divine, Toronto, for over 50 years, and in the early eighties he took vows as a monk with the Society of St. John the Evangelist, and entered the society’s monastery at Bracebridge, Ontario. He was the Superior there for two years, before moving to the monastery in Cambridge, Massachusetts. He left the monastery after a number of years and entered into another stage in his long and fruitful ministry as a monk in the world. Fr. Frere was a godly, gentle man devoted to prayer and a respected spiritual director. The funeral service will be held at St. Peter and St. Paul’s Anglican Church, 152 Metcalfe St., Ottawa, Ontario, at 11 a.m. on Tuesday, April 23, 2019, with the Rt. Rev. Charles Masters, Diocesan Bishop of the Anglican Network in Canada, as Celebrant. Reception to follow in the church. Visitation on Monday, April 22, from 2 to 4 p.m. and 7 to 9 p.m. at the Central Chapel of Hulse, Playfair and McGarry Funeral Home, 315 McLeod St., Ottawa, Ontario. In memoriam donations, if desired, to the Capital Campaign Fund of St. Peter and St. Paul’s Anglican Church, to Billings Lodge Retirement Home, 1180 Belanger Ave., Ottawa, Ontario, K1H 8N2, or the Perley and Rideau Veterans’ Health Centre, 1750 Russell Road, Ottawa, Ontario, K1G 5Z6.